Simone Di Benedetto was born in Modena in 1989. 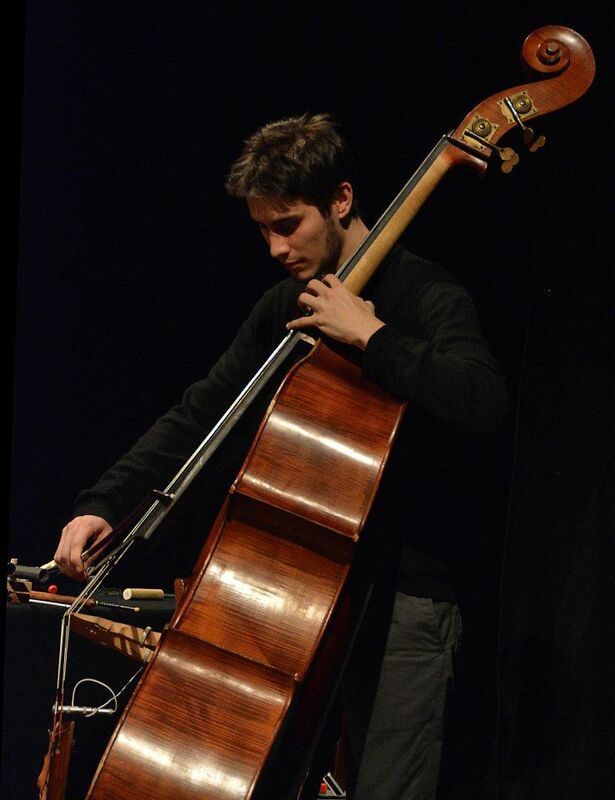 He graduated with honors in doublebasses from Modena’s conservatory Vecchi-Tonelli and then he specialized under M° F. Petracchi at Walter Stauffer Academy in Cremona and The Chigiana Academy. Meanwhile he started studying classical composition. At the same time, he got close to jazz music, studying and practising with musicians such as Salvatore Maiore, Roberto Bonati, Paolino Dalla Porta, Eddie Gomez, Drew Gress, Dario Deidda, Ben Street, Furio Di Castri, Massimo Moriconi, Glauco Zuppiroli, Ares Tavolazzi. He graduated in electric bass at Accademia di Musica Moderna in Modena. Since 2010 he takes part to the workshops (Laboratori di Ricerca Permanente) coordinated by Stefano Battaglia at Siena Jazz Foundation. Since 2014 he works with Nicoletta Giberti, actress and director of Festival della Fiaba, on narrative improvisation and on the relationship between music and language. He is also collaborating with the narrator Simone Maretti playing and writing the music for their performances. He played with musicians such as Franco Cerri, Stefano Battaglia, Fred Hamilton, Achille Succi, Pasquale Mirra, Francesco Cusa, Piero Bittolo Bon. He performed with original project within Italy and abroad in Belgium, Spain, Swaziland, Slovenia, playing at festivals such as Umbria Jazz, Jazz It Festival, Ravenna Festival, Barga Jazz, Tuscia in jazz Festival, Festival della Filosofia, Festival delle arti, Musicultura, and took part at radio shows such as Rai Radio3, Rai Radio1, Radio Kairos, Radio Moon, Slovenia’s National Radio. He was finalist in many contents such as Barga Jazz, Spezia Jazz (third place), Bologna Festival delle Arti (second place), Jimmy Wood Award, Chicco Bettinardi (first place audience award), Premio A. Zamparo (third place). As a composer, he wrote music for Grandezze e Meraviglie Festival and for ERT, along with many collaborations with dance companies and with the choreographer Teri Jeanette Weikel. In 2016, he won the first place and the audience award at Antico Futuro content. Concerning classical music, he played with many orchestras and music ensemble such as Orchestra Verdi di Parma, Altrevoci Ensemble, Orchestra Maria Judina, AdM ensemble. In July 2013 he played in Orchestra Cherubini and Orchestra Giovanile Italiana under the direction of M° Riccardo Muti, live on Radio 3 and Radio 1.